Flavoring (natural & artificial flavors 875mg, sucralose 210mg, acesulfame potassium 30mg), Color 140mg (tumeric, spirulina, soy protein isolates, maltodextrin). As a dietary supplement, mix 1 heaping scoop of PRE into 12-14 ounces of water and consume 30-45 minutes prior to resistance training. Vary the amount of water to achieve your desired flavor level. DO NOT EXCEED 1 SCOOP IN ANY 24 HOUR PERIOD OR USE MORE THAN 5 DAYS IN ANY 7 DAY PERIOD. KEEP OUT OF REACH OF CHILDREN. This product is only intended to be consumed by healthy adults 18 years of age or older. Do not use if you are pregnant, breast feeding, have known medical conditions (including but not limited to kidney, heart or liver disease) or are taking prescription or OTC medication(s). Consult with your health care practitioner before using this product. Do not use under extreme conditions of heat, CARDIOVASCULAR EXERTION or dehydration. Discontinue use and consult with your health care professional if you experience any adverse reaction to this product. Do not exceed recommended serving. Flavoring (natural & artificial flavors 625mg, sucralose 210mg, acesulfame potassium 30mg), beet powder (color) 30mg. Mar 22, 2019 NutraBio Dragon Fruit Candy Flavor System: Now in Six Supplements! NutraBio's Pre/Intra supplements got the candy treatment with the new flavor - specifically, Dragon Fruit Candy! Read the big buzz from NutraBio here! Two decades ago we set the goal of providing our customers with the most effective, clean and honest supplements available. Since that very first day, we have led the charge in supplement innovation with science-backed doses and full label disclosure. Clinical doses of 14 research-backed ingredients. Since day one NutraBio has never been happy maintaining the status quo when it comes to pre-workouts. We have always been the innovators; not the replicators. Although the industry makes it seems like non-proprietary blends, proper dosing, and scientifically backed ingredients are something new; the fact is NutraBio pioneered this trend over 15 years ago. We focused on creating the best, and we've done just that with PRE Stim-Free. PRE Stim-Free has everything you need in one comprehensive, open label, clinically dosed formula and nothing you don't. We pride ourselves on purity. What you see on the label is exactly what you get. PRE Stim-Free contains no fillers, excipients, proprietary blends, or other potentially unhealthy or unneeded additives. At the end of the day, NutraBio isn't just about marketing hype and trying to maximize our profit. It's all about giving athletes what they want to meet their performance needs by giving them access to clean supplements that are innovative and effective. Like you, we want to train hard and see the results of our efforts. 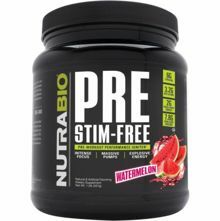 Compare NutraBio PRE Stim-Free to any other stimulant free pre-workout on the market and ask yourself whose formula was created WITHOUT COMPROMISE. We think you'll find that even the most "self-proclaimed" strongest formulated stimulant free pre-workouts pale in comparison to PRE Stim-Free. Game over. NutraBio PRE Stim-Free dominates the stimulant free pre-workout landscape..
A closer look at the 14 ingredients and doses used to make NutraBio PRE Stim-Free the premier stimulant free pre-workout on the market. NutraBio's leucine is derived from fermented vegetables sources as opposed to animal based sources. Decarboxylated arginine cannot be broken down in the liver and consequently increases blood flow to working muscles through vasodilation. PRE uses a vegan source of agmatine that us derived from fermented plants. Nitrosigine is a bonded complex of arginine and silicon that helps enhance nitric oxide levels to a greater degree compared to arginine alone. BioPerine is a patented extract of the fruit of black pepper that contains standardized amounts of the active ingredient piperine.